Water features such as Koi ponds, water gardens, streams, fountains and waterfalls have become the hottest landscaping trend in America today! Not only do they provide a tranquil and relaxing garden atmosphere for the homeowner, but also add an entirely new dimension to your property. 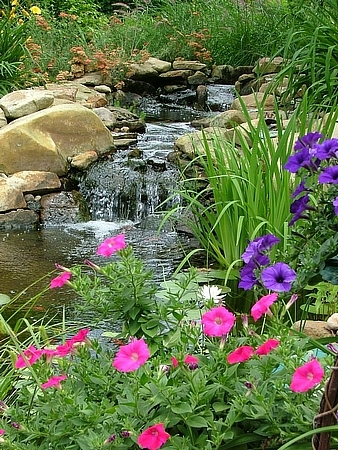 Water features, like other types of landscaping, mature with age and increase the value of your property more than any other type of home improvement. Today's water gardens are environmentally friendly and completely customized to be installed anywhere. According to a recent study by the American Nursery & Landscape Association, improved landscaping can increase property value by 7% to 14%. The study also found that landscaping can accelerate the sale of your home by 6 weeks!